We’ve taken everyone’s favorite, artichoke dip and spruced it up for the holidays! We’ve added spinach and tomatoes for some fun color, and baked it in individual, bite-sized servings. While prepared phyllo cups are frequently available in grocers’ frozen food section, it’s nearly just as easy to make your own. You’ll find that they taste so much fresher and better. 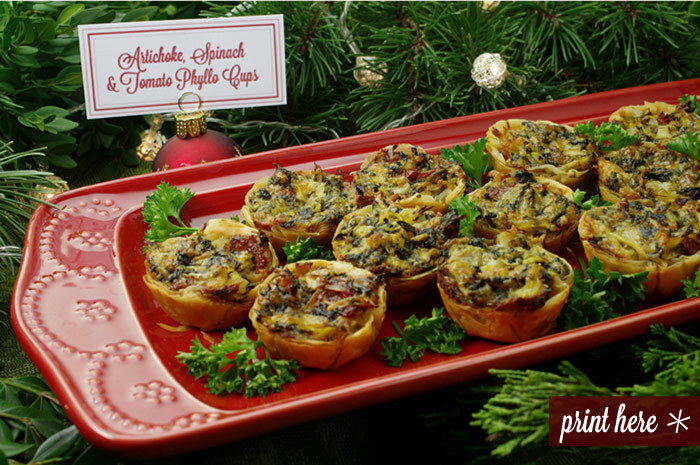 If you have more filling than phyllo, simply place any extra in a small buttered casserole and bake along with the phyllo cups. Serve as a warm dip with crackers, or save for the next day! 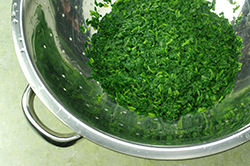 (1) Thaw the chopped spinach in a colander. Press the spinach to remove any excess water. Drain the artichokes and chop. 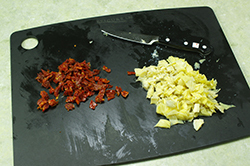 Drain and chop the sun-dried tomatoes. 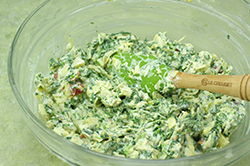 (2) In a medium bowl, place the spinach, artichokes, and tomatoes. 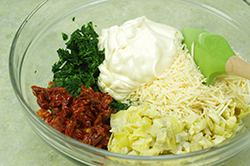 Add the grated Parmesan cheese and mayonnaise. Stir to combine. (3) Preheat the oven to 350°F. Prepare 4 mini-muffin pans by brushing the inside of each well with some of the melted butter. 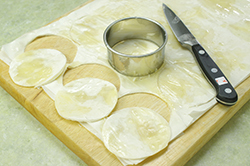 (4) Prepare the phyllo cups by placing one sheet of phyllo dough on a working surface. Dot the surface with melted butter using a brush. Layer a second sheet on top, and dot with butter. Repeat until there are five sheets of phyllo dough stacked. Brush the entire surface of the last layer. (5) With a 3-inch round biscuit cutter, cut out circles. Place each circle in the well of a mini-muffin pan tucking and pleating to fit. 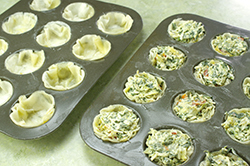 (6) Fill each phyllo cup with the prepared filling. Bake in a 350°F oven for 20-22 minutes until the phyllo is nicely golden and filling set. Serve warm or at room temperature. (1) Mix the filling up to one day ahead of time and store in the refrigerator. (2) Bake the filled phyllo cups earlier in the day. Chill, then reheat prior to serving.